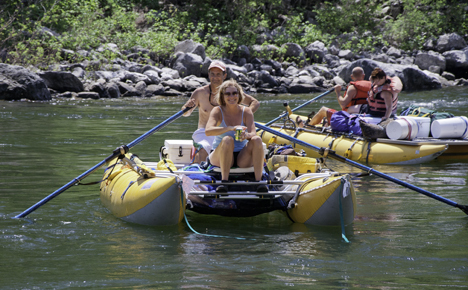 White Bird's close proximity to Hells Canyon National Recreation Area and the Salmon and Snake Rivers offers the outdoor enthusiast a wide array of recreation including whitewater rafting, jet boat tours, fishing, hunting, hiking and biking trails. White Bird Grade Hill Climb 13 miles, benefit for the Syringa Hospital. 6 miles south of White Bird on Highway 95 at Twin Bridges. Clearwater National Forest. Ranger Station - 502 Lowry, ID 83540. Phone: 208-926-4274; Fax: 208-926-6450. Fishing, hunting, ATV's, hiking trails, cross country skiing, snowmobiling and snowshoeing. The site lies along the Lower Salmon River approximately 2 1/2 miles from Highway 95 and has a concrete boat ramp, picnic tables and BBQ grills. Nez Perce-Clearwater National Forests. Slate Creek Ranger Station: 304 Slate Creek Road, White Bird, ID 83554. Phone: 208-839-2211; TDD: 208-839-2328; Fax: 208-839-2730. Biking and hiking trails, horseback riding trails, fishing, hunting, OHV riding, boating, swimming, cross country skiing, snowshoeing and snowmobiling. Nez Perce National Historic Park. 39063 Highway 95, Spalding, White Bird, ID 83540. Phone: 208-843-7001; Fax: 208-843-7003. Hiking trails through historic areas, some with interpretation. A map of the trail system is available and a guide for the river trail. Picnic tables and restrooms also available. Whitewater rafting, kayaking and canoeing. *Also see the Go Northwest! Activities guide to Riggins.